Sage Shuka's Naadi; the 5000 years old palm scriptures about the prophecy of the Advent of Sai Baba. 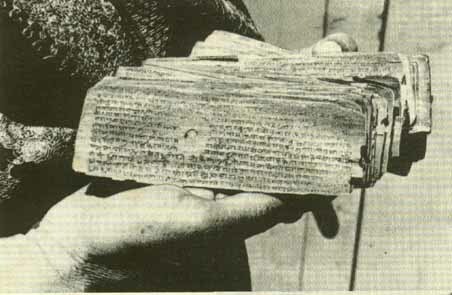 Naadi means palm leaf manuscripts written by ancient sages. This Naadi was written 5,000 years ago by Sage Shuka. The 100 or so manuscipts, containing prophecies about the background and Advent of Lord Sai Baba, are in the possession of a famous astrologer Dr Shastry. His attitude towards mena dn women will show equality. He will give Samadhi Darshan to Shirdi Sai Devotees; and similarly, after he has flown from this body, Sathya Sai devotees will have Samadhi Darshan at Whitefield which will be venerated as sacred soil. His life will be for the good of mankind in the way described by Krishan in the Bhagavad Gita. When he publicises any aspect of himself or his activities, whjich is not always, he does so at particular times and it is only and always for the growth of righteousness: instilling good ideas of life and creating an atmosphere of goodwill. Sri Sathya Sai Baba will prove in the course of time the truth of the saying "Dharma wis protected by the portector." He has great purification powers. Merely the sight fo him, or the slightest of word exchanged with him, can purify one. Sathya Sai Baba will always retain a youthful look, age nothwithstanding.